1 registered (Emily O), 16 Guests and 10 Spiders online. Has anyone ever been to Grinnell Lake which is West of Pioneer Basin up the Laurel Creek Trail? I'm considering a detour to it this summer and I can't seem to find a single image of it to see if it's worthy of spending an extra day on. I had to go look it up since I haven't heard the name. Given the state of the Forest Service budgets, that trail might even be hard to find. But I bet it would be a nice place to see -- doubt you would see a soul at all. And it would be cool to get to the top of Red and White Mtn -- I think it is a pretty rugged and colorful peak looking from the Mammoth side. 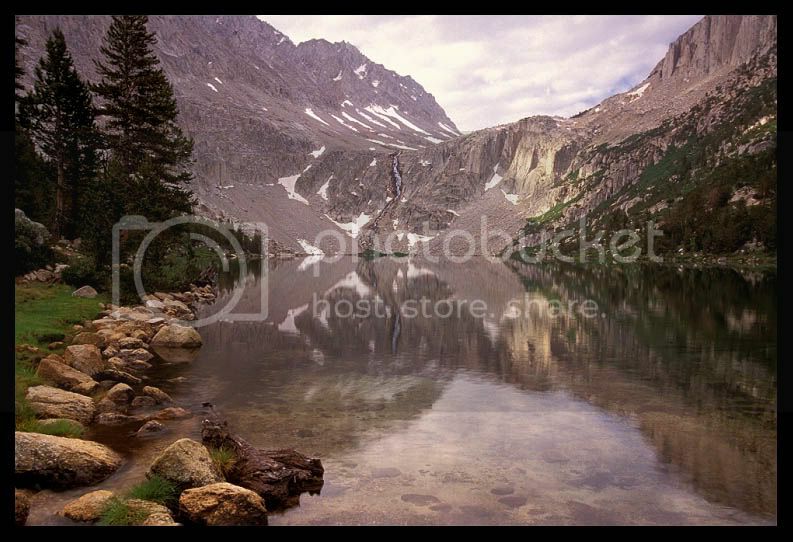 Here's the results of a search on Flickr for "Grinnell Lake". Looks very nice, indeed! Trying viewing as a full screen slideshow. Edit - Well, after scrolling through a ton of pics on this slideshow, I ran into one with a reference to Glacier Natl Park (and I'm pretty sure all the other pics are of the same lake and area). So maybe the wrong Grinnell Lake came up in my search. If future generations are to remember us with gratitude rather than contempt, we must leave them more than the miracle of technology. We must leave them a glimpse of the world as it was in the beginning, not just after we got through with it. Great photos,CaT, unfortunately, the wrong lake! Those are in Montana, he's asking about the one in Ca, below Red and White Mountain. Yeah ... just discovered that about the time you posted. Wow, the one in Montana is beautiful! and found this picture from this thread in High Sierra Topix. There is one more picture of Grinnell Lake just below that one in the thread. And a second from that thread, titled "Looking back at Red & White"
Ken, you participated in that thread from High Sierra Topix, about hiking with a badly bleeding shin. I'd completely forgotten about the discussion. Thanks for the info, I had almost noted the fact that there was the other lake in Glacier National Park since I found it while trying to search. This is one reason why I like taking lots of pictures and labeling them the best I can to have an archive of locations in the Sierra. I think i'll go to Grinnell Lake from VVR and then to Pioneer Basin and resume. WR is ?? - should it go in the acronym list? Oh VVR - never mind. And VVR ( V.V.R ) stands for Vermillion Valley Resort, the name of the outfit at Edison Lake running the ferry and restaurant/resort. In most fonts, VVR looks like WR. The body betrays and the weather conspires, hopefully, not on the same day. Grinnell Lake is just two miles due west of the Pioneer Basin, but there are two ridges (11.5 to 12k) and a 10.5k valley in between. Here's a MyTopo link. Be sure to click the "MyTopo" button in the upper right corner of the map so you can see the contours. Excellent -- thanks, Steve! I specifically remember standing by one of the lakes and staring up at Hopkins, so I know exactly which direction the area you speak of would be. It is funny, though, that one would never envision a whole other valley/ridge beyond what I could see. It was my first time to the SeKi area, so I was overwhelmed by the recesses and personalized mini-lakes. I wasn't planning a cross country trek to Pioneer Basin, i'll just go back to the trail and go that way, it's only like 11 miles from Grinnell Lake to Pioneer Basin, i'll probably make the 0.4 mile detour to see what Laurel Lake looks like also. Since my loop East from VVR was only 4 days to MTR I thought might as well add another detour. The trip from vvr is a great way to go. Pioneer Basin seems to be "the" place to go in the region. personally, I like the Fourth Recess, for many reasons: the beautiful lake, the wonderful waterfall, the last place Norman Clyde camped in the Sierra. Lotsa history up Mono Creek. The owner of VVR is Jim Clement, my old hiking and climbing partner. He's a great guy, and the resort is a kick, if you've never been there. More of a rustic ranch. I completely agree with you, Ken, that Fourth Recess is impossibly beautiful. In one location, all of the scenic and photographic ingredients are in check. I found the mystery and depth of the recesses to be most intriguing. Do you consider Fourth Recess Lake to be the highlight or do you travel all the way up to Snow Lakes? On a TSDH from RCC to VVR you see all four Recesses in one day. Give 'em a break on the acronyms. It's all good unless we start using Lolspeak! That trail is also known as TNEEVOF. (The Never-Ending Elastic Valley Of Infinity). Edit Reason: Sentences (at least on this forum), end with a period. I agree, Ken -- one of the best trip reports that I have had the pleasure of reading. I appreciate the author's lack of flourish,all the while, still including incredible descriptions/photos and even a couple of recipes. I will consider this TR a fine template should I ever be inspired to write one, myself. Ken that is a SPECTACULAR photo!! !What a great wall hanging that would make. Well I plan to layover a day in Pioneer Basin so I suppose I could hike over to the Fourth Recess Lake and back, i'll have to see how I feel. At this point I think I need to put a cap on adding more days into this hike, I have already crossed the 60 day mark. Had a chance to read that trip report and I agree it was done quite well. Very beautiful locations! I think I will go ahead and take the cross country route over the same ridge he did between Grinnell Lake and Lower Hopkins Lake, looks to be worth it. Generated in 0.152 seconds in which 0.126 seconds were spent on a total of 14 queries. Zlib compression disabled.